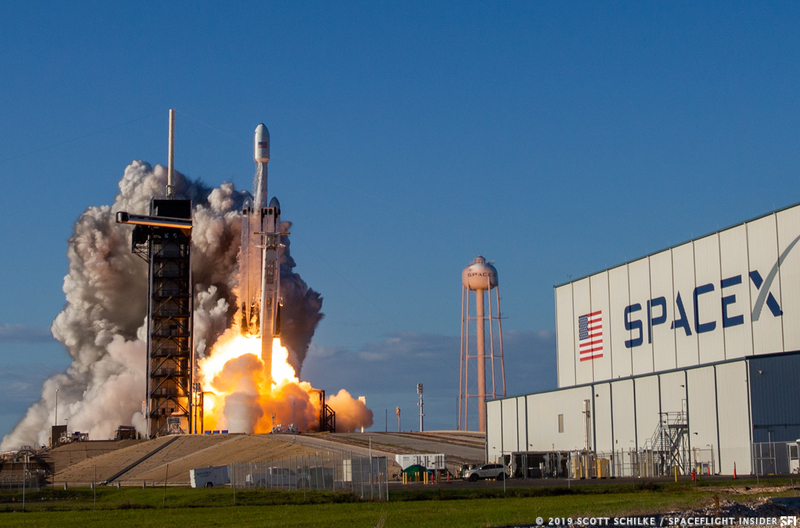 KENNEDY SPACE CENTER, Fla. — After a wait of more than a year, SpaceX’s massive Falcon Heavy rocket has finally begun launching commercial payloads.SpaceX also managed to mark another (or was it three?) notch in its milestone list with today’s flight. Liftoff took place at 6:35 p.m. EDT (22:35 GMT) April 11, 2019, from Kennedy Space Center’s Space Launch Complex 39A. The triple core-booster once again awed those watching with its power as well as the unique twin side-booster return to nearby Cape Canaveral, producing two sets of three sonic booms as the two 150-foot (49-meter) tall vehicles gracefully touched down at Landing Zones 1 and 2. The launch took place several days later than initially planned. 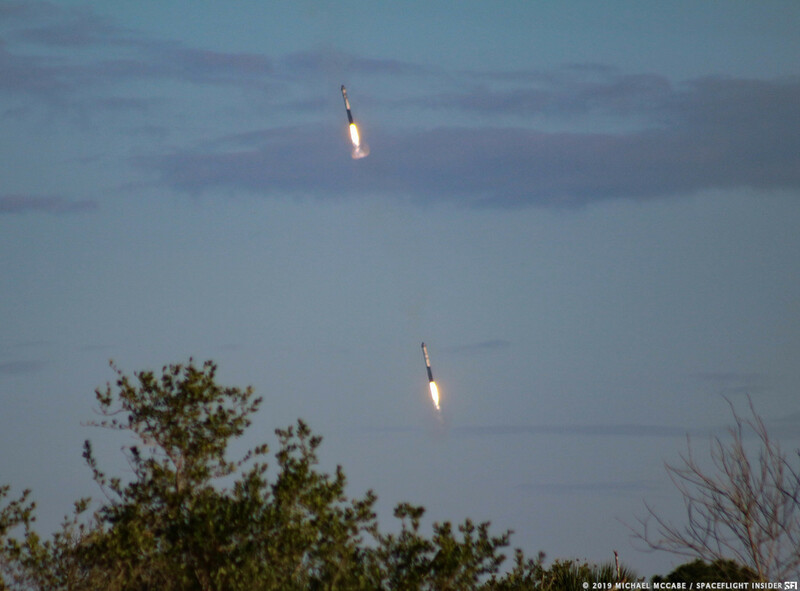 Following an April 5, 2019, static fire test, in which all 27 Merlin 1D engines fired for several seconds to ensure adequate health, SpaceX announced that an April 7 liftoff wouldn’t be attempted, and was instead scheduled for April 9. April 9 proved to be uncooperative as a combination of poor weather and high upper level winds prompted mission managers on April 8 to push the launch back another 24 hours. The weather was expected to have an 80 percent chance of favorable conditions with the only concern being the potential for cumulus clouds on April 10. High winds again forced managers to postpone the flight – to today. While this might seem a slower pace for a typical SpaceX launch campaign, company CEO Elon Musk tweeted that teams were proceeding with extra caution as this is the first Block 5 version of the Falcon Heavy. The billionaire cautioned that there was a 5-10 percent chance of failure. Those estimates proved to be incorrect. During the maiden flight in February 2018, the launch utilized Block 4 and Block 3 cores. Being sent to orbit on this first commercial flight of the Falcon Heavy was the Arabsat-6A satellite, a 13,000-pound (6,000 kilogram) satellite built by Lockheed Martin (off of the A2100 satellite bus) for Arabsat and King Abdulaziz City for Science and Technology. Arabsat-6A was ultimately placed into a geostationary transfer orbit. From there it will use its onboard thrusters to circularize itself into a geostationary orbit—roughly 22,300 miles (35,900 kilometers)—at the 30.5 degrees East location. There it is planned to provide television, internet and phone services to Middle Eastern customers, as well as those in northern Africa for a planned operational life of about 15 years. 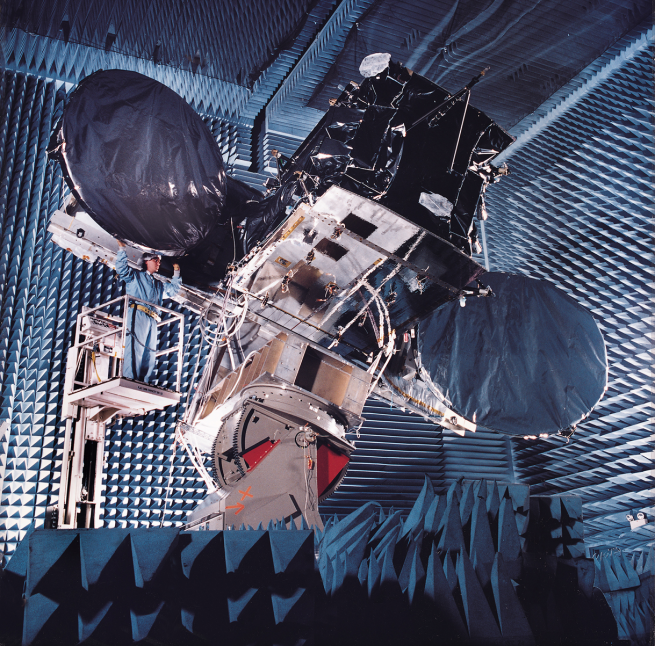 To get the satellite into orbit, however, required a number of things to go correctly. Once the 27 engines successfully ignited at the base of the rocket and spooled up to full power, the full 230-foot (70-meter) stack began to rise away from Launch Complex 39A, clearing the tower shortly thereafter. As the rocket continued to accelerate, it began rolling and pitching toward its designated orbit, reaching maximum dynamic pressure—the moment of peak forces on the rocket by the atmosphere—some 69 seconds after liftoff. About a minute and 25 seconds later, the two Falcon side boosters consumed most of their fuel and separated. Meanwhile, the center core, which was at a lower throttle than the two side boosters, spooled up to full power to continue pushing the spacecraft toward orbit. As the booster separated, they immediately began to turn retrograde and each fired three engines to not only cancel their downrange motion, but to begin flying toward Florida. This newtonian choreography, all done via algorithms on each booster’s onboard computer, continued for a short time before another three-engine burn. This burn was performed to cushion the vehicles’ re-entry into Earth’s atmosphere. About six minutes and 11 seconds after they left LC-39A the boosters each carried out a final landing burn. Each booster started by firing three engines for several seconds before shutting down two of the engines and only use the center engine to conduct landing. During this time, the core stage continued to accelerate toward orbit for a minute after the side cores separated. Once it’s fuel was nearly depleted, its nine engines shut down before separating from the second stage. Once clear from the second stage’s lone Merlin 1D Vacuum engine, the first stage began to orient itself for re-entry into the atmosphere. While it performed an entry burn and landing burn similar to the side cores, the center core was going too fast to return to land. Instead, it began targeting SpaceX’s Autonomous Spaceport Drone Ship named Of Course I Still Love You, which was stationed roughly 600 miles (1,000 kilometers) downrange in the Atlantic Ocean. It landed successfully, unlike the first Falcon Heavy center core attempt more than a year ago. It’s landing marked the first time all three cores of a Falcon Heavy were successfully recovered. All three are expected to be refurbished and used for future flights, including the next Falcon Heavy mission, currently targeting June 2019. While the first stage was on its way to a successful landing trajectory, the second stage continued to fire its engine to enter into a parking orbit. This occurred some nine minutes after it had arced out over Florida’s coast line. Following a five-minute coast period, the second stage ignited its engine again for roughly one minute and 24 seconds to place Arabsat-6A into a geostationary transfer orbit. Arabsat-6A separated and was on its own about 34 minutes after the Falcon Heavy had lifted it off of LC-39A. 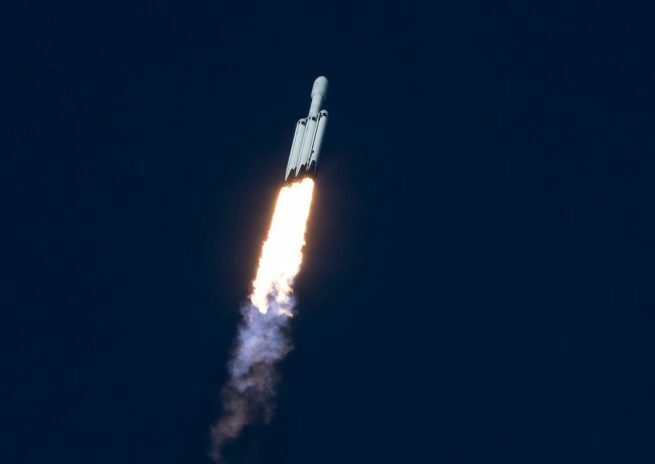 SpaceX described the day’s events on Twitter as such: Successful deployment of Arabsat-6A to geosynchronous transfer orbit confirmed—completing Falcon Heavy’s first commercial mission! This was SpaceX’s fourth launch of 2019 and the second overall for the Falcon Heavy. All three cores were on their first flight. It was also the 36th, 37th and 38th successful recovery of a Falcon first stage. Next up for SpaceX is planned to be the launch of the CRS-17 Cargo Dragon capsule to the International Space Station. Right now, station managers are expecting that flight to occur on April 25. Meanwhile, neighboring Pad 39B lies idle and unused for a decade awaiting a fully expendable big dumb booster.